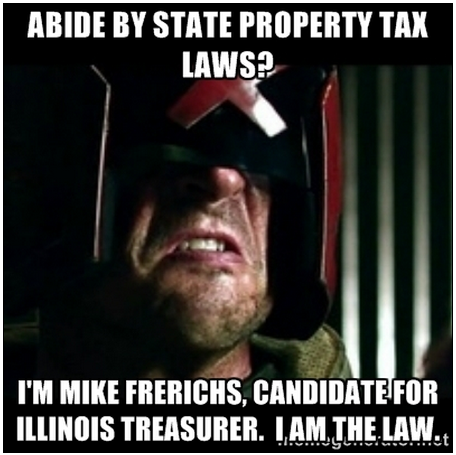 Treasurer's Candidate Mike Frerichs on Property Taxes: "I AM THE LAW"
Those of you know - like us - enjoy a good Sylvester Stallone/Rob Schneider vehicle - will know where this meme came from. Thanks to one of our readers who is - apparently - a big Judge Dredd fan for sending it our way. Seems very appropriate now that Mike Frerichs - Democrat candidate for Illinois Treasurer - apparently thinks he's 'above the law' by not having to pay his property tax bills.